I have recently been trying to cut wheat/gluten and dairy out of my diet as a way to try and eliminate some digestive issues I have been dealing with for some time now. I am not really sure if I do have a tolerance issue with these items, but I have determined that by cutting those out I do feel much better, so for now I am going to continue to do what I am doing. So far I have been doing pretty well with finding healthy alternatives that do not contain wheat/gluten and dairy, but one thing that I am struggling to replace is baked goods. All baked goods seem to have both of these ingredients, and even gluten free items sometimes contain dairy. 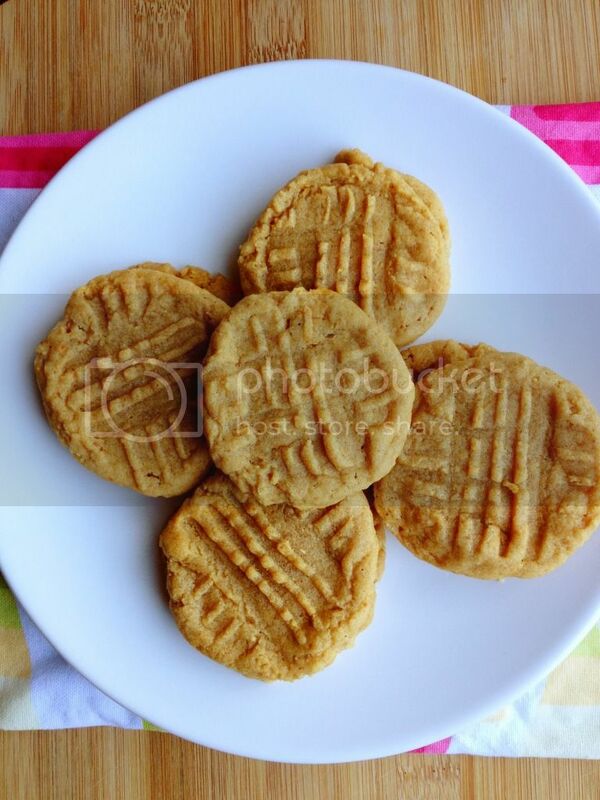 I have been craving cookies, which are my weakness, and when I came across this 4 Ingredient Peanut Butter Cookies recipe the other day I had to immediately try it. I then realized that I had posted a similar recipe a while back including chocolate chips, but since I am cutting out dairy, I thought I would try them without the chocolate chips and see how they were. This time I also made sure to criss-cross smash them with a fork to help them spread out a little more. I didn't do that when I first made these, and they were kind of like little round ball cookies. Smashing them did help them to spread out and look more like typical peanut butter cookies. These cookies taste like the real thing, and are SO satisfying! They are a little more delicate since they do not include the flour. I also used all natural peanut butter which contains ONLY peanuts. This peanut butter is a little softer than original peanut butter, so it was really easy to mix by hand, no need to pull out the mixer. The recipe I made below is very simple, and actually easy to remember since it's 1 of everything. Preheat your oven to 350 degrees. Mix all ingredients into a bowl and then spoon onto a cookie sheet. Please note that I did place mine on foil so that they did not stick. Smash with a fork in a criss-cross pattern. Then bake for 7 minutes and enjoy!